Charlie came home the other day with an enormous foam hand. 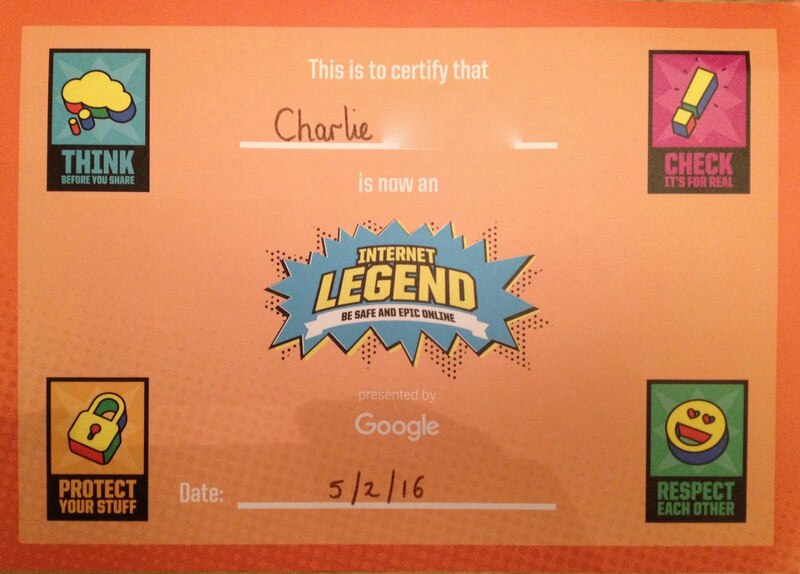 He is (according to the certificate he also received) an 'Internet Legend'. What that means, in practice, is that he's aware of the do's and don'ts of going online, which is now being taught in schools a bit like the Green Cross Code used to be when I was a lad. Because, as we know, you can't be too careful. Today, as it happens, is Safer Internet Day - a day coordinated by the UK Safer Internet Centre that sees hundreds of organisations getting involved in promoting safe, responsible and positive use of digital technology for children and young people. And, of course, the government needs to take a lead, too. To this end, internet safety is now a compulsory part of the curriculum. Schools teach e-safety during PSHE lessons and every school is required by law to have measures in place to prevent all forms of bullying including cyber-bullying. 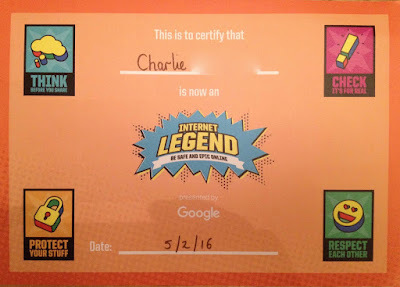 New industry-led awareness raising initiatives (including Google’s ‘Internet Legends’ tour which visited Charlie's school recently) are also helping kids stay safe online, enabling them to get the most out of all that the internet can offer. The internet is a powerful tool which can have brilliant and virtually limitless benefits, but with this does come some risk. We are working hard to address these online risks but we can’t do it alone, parents are vitally important in making sure that children stay safe online. We want to make sure young people are educated, and parents as well as teachers, are knowledgeable and actively involved in promoting internet safety so that children are able to safely enjoy all that new technologies have to offer.